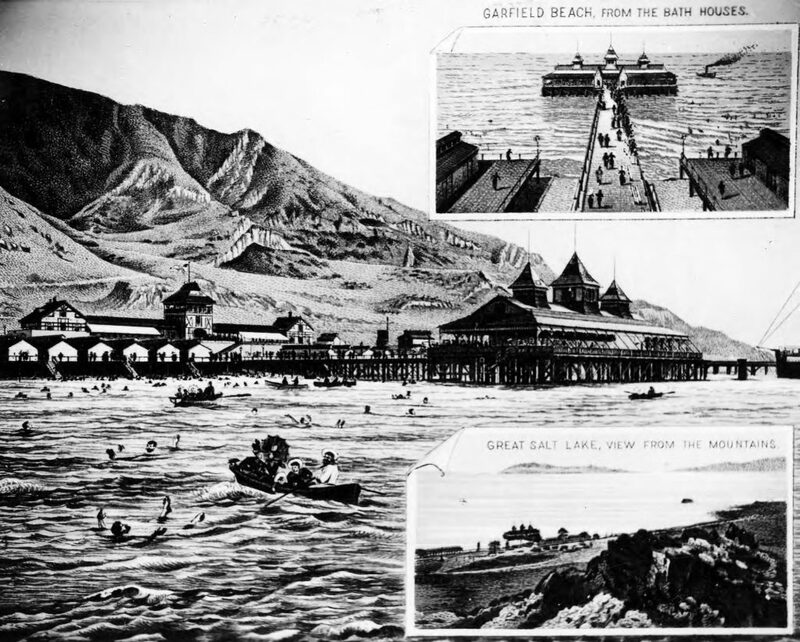 From 1881 to 1893 Garfield Beach was the most famous and finest recreation resort on the shores of the Great Salt Lake, with its railroad station, lunch stand, restaurant, bath houses and pier leading to the dance pavilion, and with the pioneer steamboat “City of Corinne” exhibited at anchor. Lake Point was located 1 miles west. A three story hotel erected there by Dr. Jeter Clinton became a stopping place for overland stages. The boulder used for this shaft was taken from “Old Buffalo Ranch” one half mile west. From the beginning of Euro-American settlement in Utah, Utahns have enjoyed recreation. 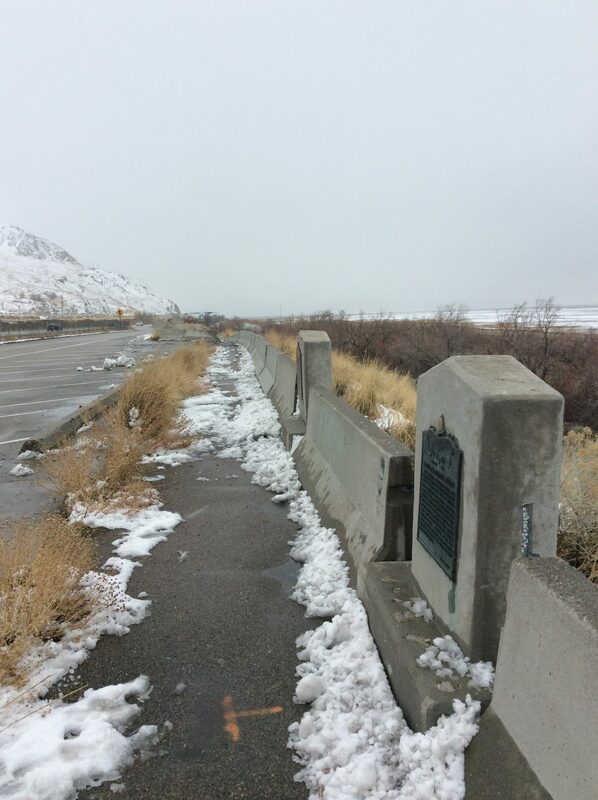 Before the rise of Wasatch Mountain ski resorts, hiking, and biking trails, residents turned to the Great Salt Lake for their recreational pursuits. The late 1800s were the heyday of Great Salt Lake resorts. 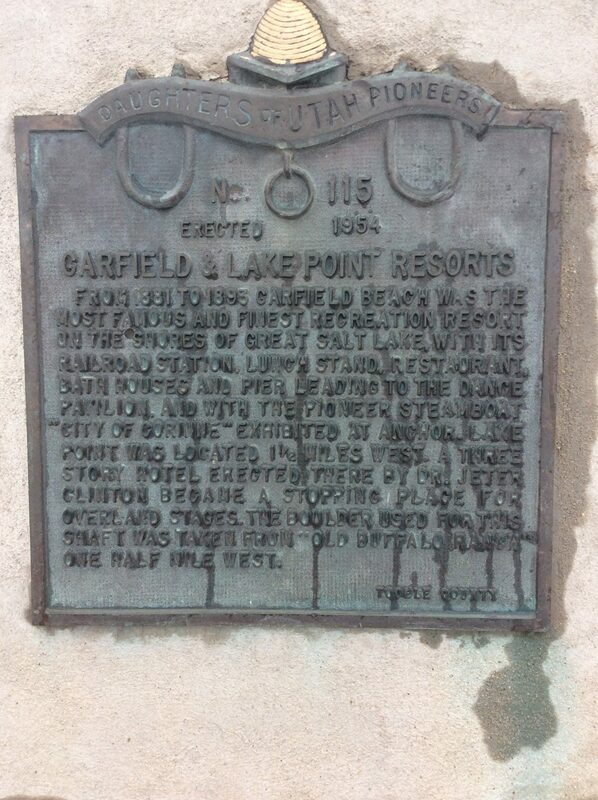 Two of the earliest resorts were at Garfield Beach and Lake Point. 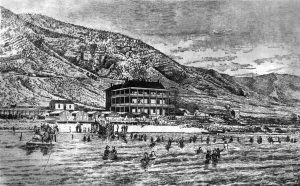 Dr. Jeter F. Clinton, Mormon physician and Salt Lake City alderman turned resort promoter, founded Lake Point resort, also known as Clinton’s Landing, in 1870, building a large “Lake House” near the beach at the northwest point of the Oquirrh Mountains. 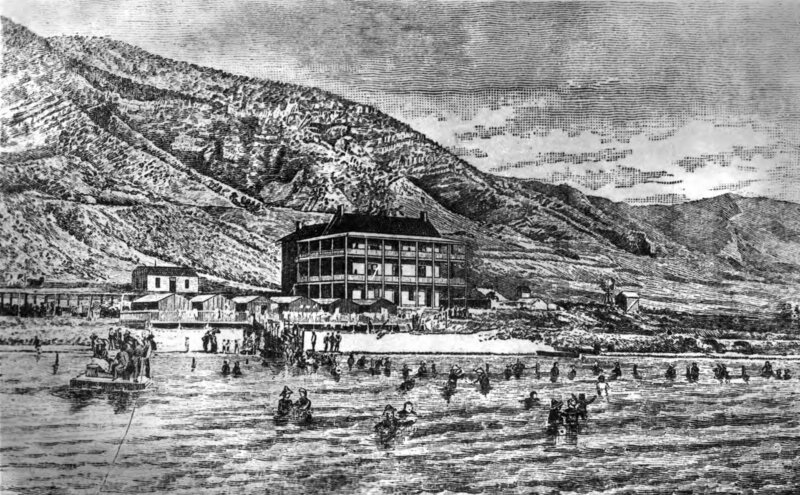 The resort remained small until 1875 when the Utah Western railroad completed a branch out to the area. Expansion began leading to the construction of a multitude of bathhouses along the beach. Bathers came to Lake Point to experience the Great Salt Lake’s saline water, described by one local booster as “so buoyant; never chilling, it is so warm, free from danger, recreating and invigorating, a tonic for all, a healing for many ills, health restoring and strength renewing.” Lake Point was also a hub for the renowned steamboat “City of Corinne” which would transport passengers across the lake to Corinne, a railroad town on the Bear River. Eventually, Black Rock and Garfield Resorts would eclipse Lake Point in grandeur and visitation. Lake Point also served as a backdrop to an interesting incidence in the Utah Territory. A breakaway from Mormonism, a group called the Morrisites under leader Joseph Morris, formed in the early 1860s. Conflict quickly ensued between the dominant Mormon population and the newly formed sect. In 1862, the territorial militia was called out to subdue the Morrisites, ultimately leading to the death of Joseph Morris. A member of the Morrisite presidency, John Banks, was mortally wounded in the skirmish. Dr. Jeter Clinton attended to Banks but he ultimately succumbed to his injuries. Shortly after Banks’s death, some Morrisites began spreading rumors that Clinton killed Banks while tending to him. Authorities largely left the rumors unheeded until 1877 when they arrested Clinton at his Lake Point home, indicting him for the murder of John Banks. While ultimately exonerated of the crime, the Deseret News reported the 1877 case as an example of “shameful abuse” of a “prominent Mormon” in which “the bigotry, intolerance and persecuting spirit of our opponents…have been among the bitterest and most unprincipled.” Taken in the context of increased federal weakening of Mormon control over the territory through the 1874 Poland Act, the Clinton case provides a curious commentary on how Mormons perceived one instance of judicial persecution in the territory. 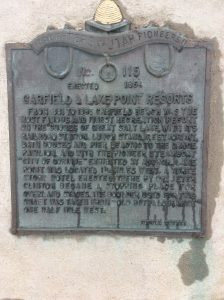 Garfield Beach resort, located approximately 1.5 miles to the east of Lake Point, opened its doors in 1875, remaining the premier Great Salt Lake destination until the opening of Saltair in 1893. 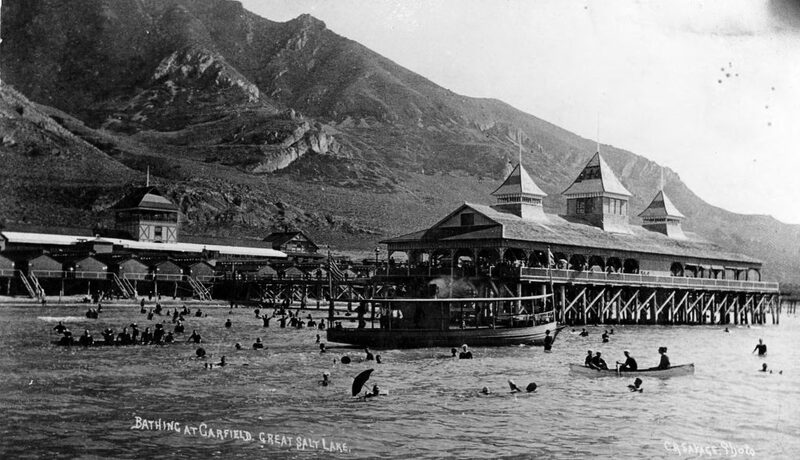 A product of the Utah Western Railway’s expansion into Tooele County, Garfield Beach wowed visitors with a 165 by 62 feet dance pavilion over the lake. The resort cost $70,000. Six trains a day serviced Garfield bringing 80,000 people to the beach in 1888. The “City of Corinne” docked at Garfield, as well, where it furnished steamboat rides on the lake for 25 cents. The great resort dwindled after Saltair’s opening, as it experienced a reduction in visitors and beach degradation due to the pesky nature of the Great Salt Lake’s fluctuating levels. 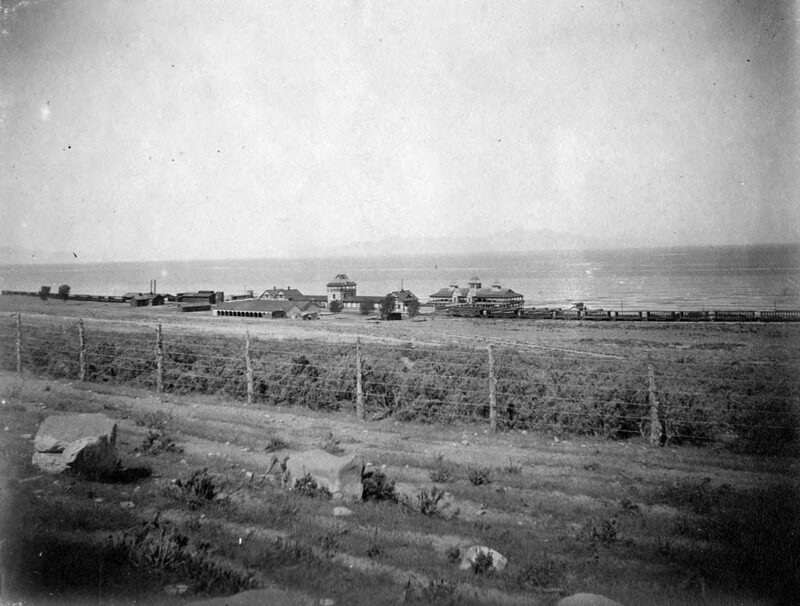 Garfield Beach resort ultimately succumbed to a fire in 1904. A 2017 trip to the southern shores of the Great Salt Lake reveals a landscape greatly changed from the high point of lake recreation from the 1870s to the 1890s. An interstate highway runs where both resorts once stood. Little evidence remains of the great pavilions, lunch bars, railroad stations, and dance halls that were the highlight of a trip to Utah in the late nineteenth century. Though a reconstructed Saltair remains, the specters of Lake Point and Garfield are long gone, eclipsed in a recreational shift from the Great Salt Lake to the Wasatch Mountains. Jared Farmer, On Zion’s Mount: Mormons, Indians, and the American Landscape (Cambridge, MA: Harvard University Press, 2009). Dale L. Morgan, The Great Salt Lake (Albuquerque: University of New Mexico Press, 1973 ), 355-356. Ovando James Hollister, The Resources and Attractions of the Territory of Utah (Omaha: Omaha Republican Publishing House, 1879), 66, accessed March 29, 2017, https://archive.org/details/resourcesattract00holl. Tooele County Daughters of Utah Pioneers, History of Utah’s Tooele County: From the Edge of the Great Basin Frontier (Tooele, UT: Transcript Bulletin Publishing, 2012), 177-179. “The Infamous Proceedings against Dr. Clinton,” Deseret News, April 30, 1879, retrieved on February 16, 2017, https://newspapers.lib.utah.edu/details?id=2661652&q=jeter+clinton&page=3&rows=50&fd=title_t%2Cpaper_t%2Cdate_tdt%2Ctype_t&sort=date_tdt+asc&gallery=0&facet_paper=%22Deseret+News%22#t_2661652. Marcus E. Jones, Resources and Attractions of Salt Lake City (Salt Lake City: Salt Lake Real Estate Board, 1889), 46-48, accessed on March 29, 2017, https://archive.org/details/saltlakecity1889eng. Ouida Blanthorn, comp., A History of Tooele County (Salt Lake City: Utah State Historical Society, 1998), 154-158. Ovando James Hollister, The Resources and Attractions of the Territory of Utah (Omaha: Omaha Republican Publishing House, 1879), accessed March 29, 2017, https://archive.org/details/resourcesattract00holl. Marcus E. Jones, Resources and Attractions of Salt Lake City (Salt Lake City: Salt Lake Real Estate Board, 1889), accessed on March 29, 2017, https://archive.org/details/saltlakecity1889eng.